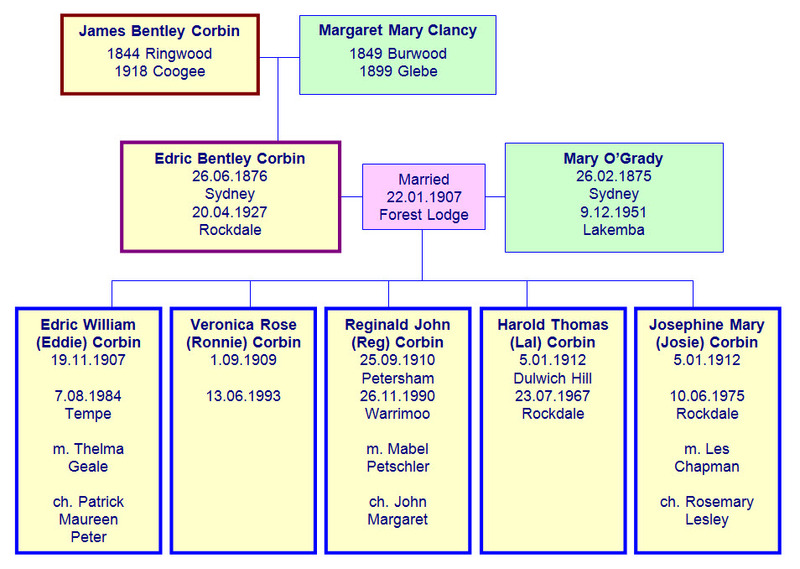 Edric Bentley Corbin, fifth child of James & Margaret, was born on 26 June 1876 when the family was living in Castlereagh St Sydney. As a single man Edric lived in George St Erskineville. 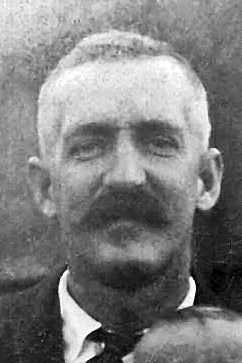 In 1907 he married Mary O'Grady at St James Forest Lodge. (Witnesses to the wedding were Annie O'Grady and Lillian Corbin.) Mary was the sister of Catherine O'Grady, who had married Percy Corbin in the same church eight years before. 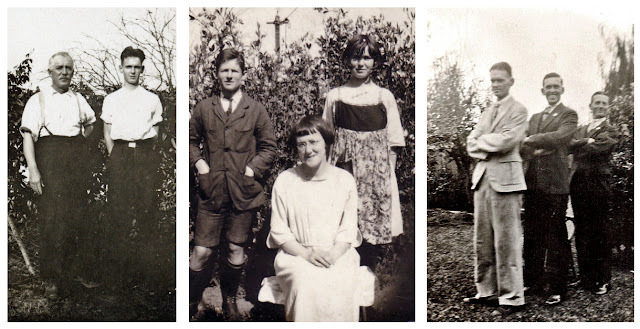 The children of these two couples thus became the 'double cousins'. The cousins were always close and some of those family ties have continued to the present day. The O'Gradys were, like the Clancys, a large and close Irish Catholic family. The parents, Patrick O'Grady and Bridget Quinlan, both came out from Ireland in the 1860s. They were living at 30 Darling St Glebe during the time that their daughters got to know the Corbin boys. For many years more, the O'Gradys were a strong influence on these two Corbin families. It seems that for the first few years of their marriage, while they were getting themselves established, the young couple Edric & Mary lived at Percy & Catherine's place in King St North Sydney. The first born, Eddie, is recorded as being born in Glebe, which may have been due to Mary going back to the O'Grady family home to have the baby. Thanks to a collection of postcards from that era held in Percy's family, we know that the Corbins at North Sydney and the O'Gradys at Glebe kept in touch and saw a lot of each other. Edric was called 'Uncle Ted' by Percy's kids. Edric & Mary then moved to Petersham, then Dulwich Hill. By the time they moved into 114 Farr St Rockdale around 1916 Edric & Mary had a family of five, including twins Lal and Josie. Edric was evidently happy to settle, unlike many of his brothers, and the family remained there for the rest of the parents' lives and for years after. Edric's occupation is not known - there is an idea he may have worked for the railways. Two of his sons certainly did follow that path, although it is said that the eldest, Eddie, was doing a jeweller's apprenticeship when his father died and he was forced to give it up. Edric died suddenly at home on April 20 1927, aged 50. Mary O'Grady died in 1951 and is buried with her husband in Woronora Cemetery. Currently there are 18 living descendants of Edric & Mary.